Ultima Thule: "I am as vigilant as a cat to steal cream"
The first thing you should know about strategic thinking in cats is this: Sometimes cats don't think strategically. Sometimes cats just fall deeply asleep and have no idea of what is going on around them. Mongol cat-eating hordes could be laying waste the countryside; a cat would not be aware. I have one cat who sleeps on her back with her paws up in the air. All she needs are little X's on her eyes and a lily between her paws, and she could become a cartoon dead cat. She is not, at these moments, thinking strategically. But many times she is. One concept familiar to strategically oriented cats is the lap as redoubt or watchtower. The cat will leap into the lap of the homeowner, apparently to have a nice snuggle and general all-around stroke event. That is her "cover story", as we say in cat-strategy circles. Actually, she is waiting for her enemies. She is uniquely sensitive to all the entrances to the room. She has selected one particular doorway as the most likely direction from which her enemies might emerge. She stares fixedly at that doorway, ears alert, eyes wide. Suppose the homeowner were to stroke the cat at that moment. Foolish, foolish homeowner. The homeowner, in this instance, is merely high ground--his job is to remain motionless and carry on with whatever sedentary activity he was pursuing before the cat arrived. In this scenario, the homeowner is the peaceful villager going about his agrarian lifestyle. The cat is the samurai, protecting the village from marauders. And you don't pet a samurai. Get a clue! Like all warriors, cats get restless in the absence of real enemies. A cat patrols its territory for weeks on end, ceaselessly on guard against all predators, also ceaselessly searching for living sources of food--your very dumb birds, your very slow mice--and yet finding nothing of interest. A cat will hide in the shrubbery or position itself behind potted plants. A cat will select the top of a fence or a crockery cabinet and stare through slitted eyes at the landscape below. Ever alert to the slightest sound, the slightest change in air pressure, the slightest flicker of shadow, it will remain true to its sacred duty unless there's new food in the bowl or something. And yet, nothing comes. A cat gets a little paranoid at times like that. All that watchfulness and no enemies--perhaps there is a larger plot to confound it. That's it, a conspiracy to devalue its function and make its mission in life meaningless. And the conspiracy is obviously being masterminded by--that thin strip of plastic! Pounce! Slash! Disembowel! Dash about meaningfully! Hurl yourself on your back as though in the final stages of a death struggle! Leap up! Attack! Stand still! Wash! It's a display designed to strike fear into the hearts of all who see it. It's the slaughter demo, a key ingredient in the strategic thinking of cats. Sometimes a cat will be taking just a little nap and suddenly a suspicious sound will arouse it. It will gaze frantically about like a police constable arriving too late at an accident. "Now then, what's all this?" it will seem to say, in the bogus British accent it employs on these sad occasions. Then it will assume control. It will patrol the perimeters of its territory. Sometimes it will get down on its belly and inch slowly through a particularly dicey bit of landscape. Once again, the craven enemy has fled; once again, peace has returned to the valley. Ostentatiously, the cat goes to a prominent place, lies down gracefully, and arranges itself in a perfect circle. The unwary might think that it was resting and unvigilant. But its eyes move and its tail lashes; it is setting a trap. But soon it is time for a nap again. so you recommend that not all in the life must be planned, there's occassion in where you have to improvise your strategy, mmmmm interesting way to look things, but could work in a real good way. 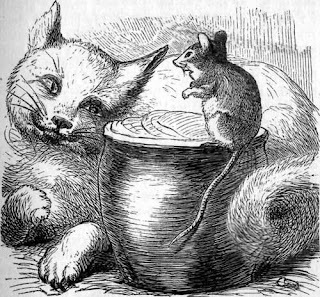 Really good image in here, it's incredible to see it because it's not normal having a good relation between a cat and a mouse.